Stems mostly bereft of leaves apart from those at the very top. White and pink flowers adorn the stem on very short stalks. Cultivated variety Rubra before it died of frost in the winter. Branches are few. Growing in the wild in a quarry, so possibly not planted. Typical are the small plume of oval leaves at the summit of every branch. 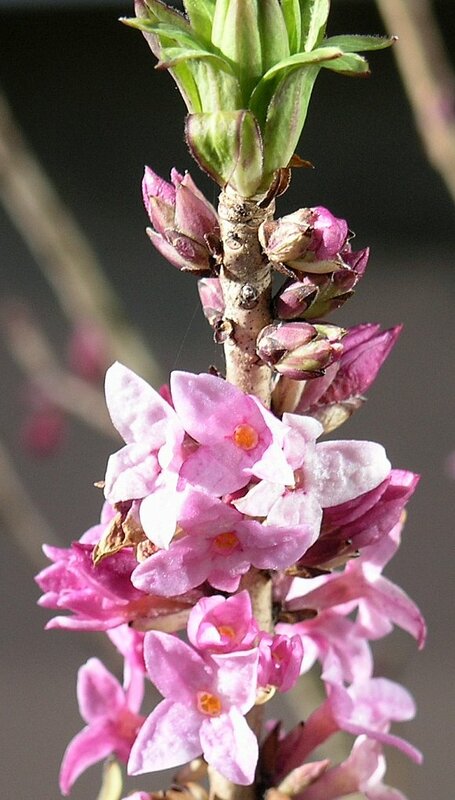 The flowers have pink or white trumpet-shaped flowers with four flared petals. The pale-fawn coloured stem usually has many bare patches. Four pinkish-lilac or white flowers have an orange coloured centre. Lanceolate pale-green leaves have very fine hairs on the edges. Un-opened buds yet to flower. 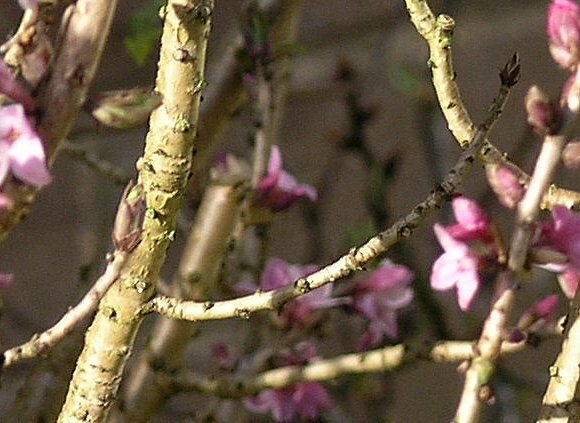 The light-fawn coloured stems are covered in a pattern of dark dots. Leaves yet to un-fold atop. The leaf buds are blackish (side branch just starting to grow on the left). Petals wrinkly and stubby. Four orange-yellow stamens within. After last winters' severe frosts it has gone very bushy, shooting out sideways, and with many more berries than is usual. Darker leaves are some other plant. 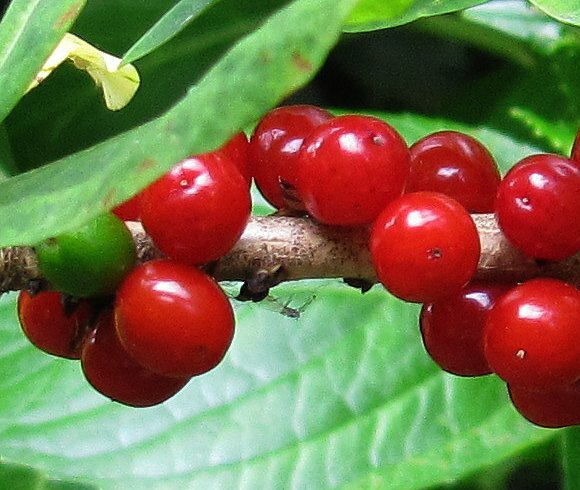 The berries are green at first, turning red when ripe. 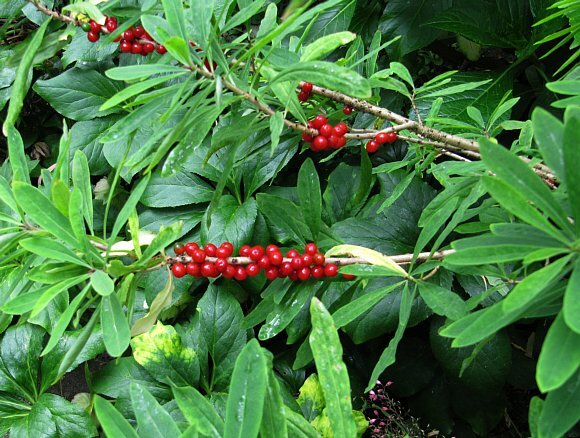 Older stems are knobbled where flowers and afterwards deadly poisonous red berries have been and gone. 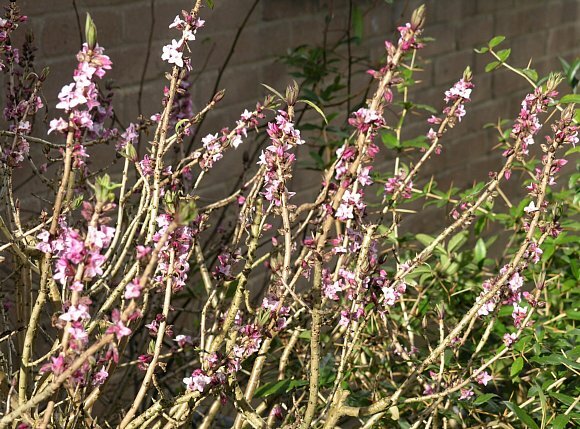 Distinguishing Feature : The otherwise bare stems closely covered in white to pink 4-petalled flowers. 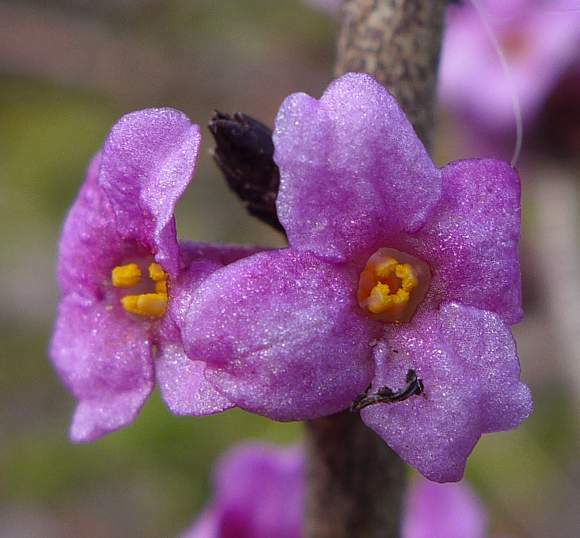 A strongly fragrant flower which some liken to that of Windolene. And when cut, the plant produces a very nasty smell. It is more likely to be found in a garden than growing wild, especially since any that are growing wild tend to be illegally uprooted and re-planted in gardens! Likes limy soils in woodlands or on scrubland. 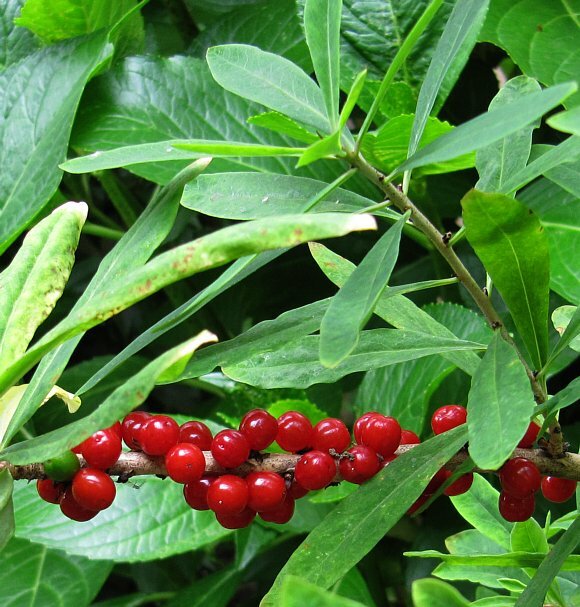 Has red-berried fruits. Leaves lanceolate and pale green. It is an alpine species, and like most, has the ability to grow much better when in a sheltered and warmer environment. It seems it is like most flowering trees and bushes this year: if they survived the long deep freeze at all last winter, then they have been prolific in flower. It may be connected with heat shock proteins (plants might have cold shock ones too). The plant has 'decided' that if it is going to survive another winter like that one, then happen it had better produce a lot more seed just to make sure. 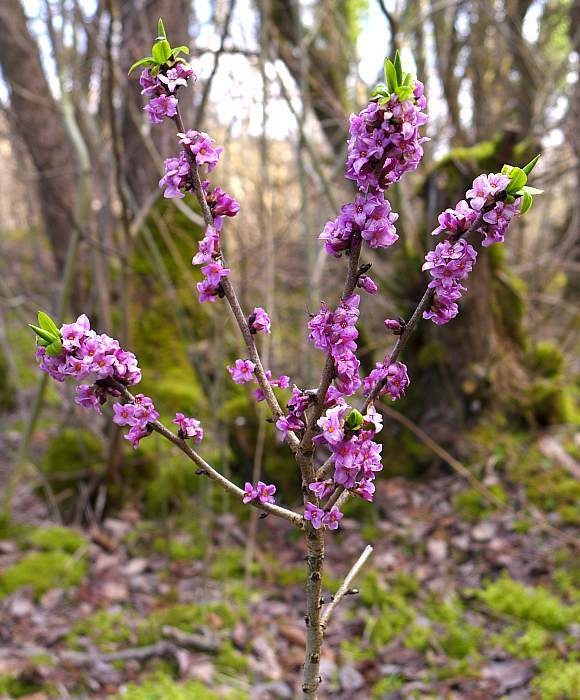 Mezereon has in the past been used in traditional medicine as a laxative. 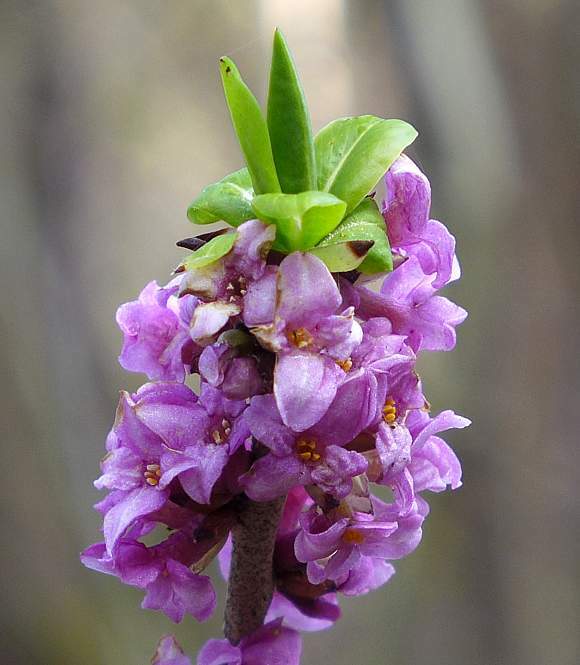 This plant is highly poisonous, being one of the most deadly poisonous plants around, its beauty belying its extreme toxicity. It contains the phorbol esters mezerein and daphnetoxin , which activate protein kinase C. These two are strong cellular poisons; abortifacients and co-carcinogens. The consumption of just 10 berries can be lethal. Not only are the two toxins potent purgatives inducing drastic diarrhoea shortly after ingestion, but they are also strong skin irritants causing urticaria, destroying skin and leading to necrosis and sloughing of dead skin. Ingestion causes first burning in the mouth, then vomiting, impaired consciousness, pupil dilation, abdominal pain, diarrhoea, vertigo, arrhythmia, delirium, serious kidney problems and death by collapse after 1 to 3 days. 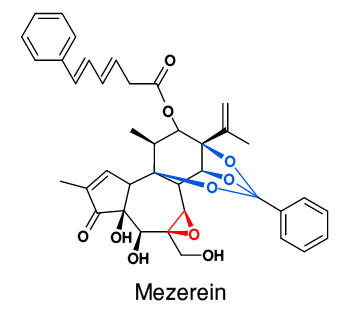 The toxins responsible for the toxicity of Mezereon are two Phorbol Esters from the Daphnane Series, Mezerein and its close relative Daphnetoxin. 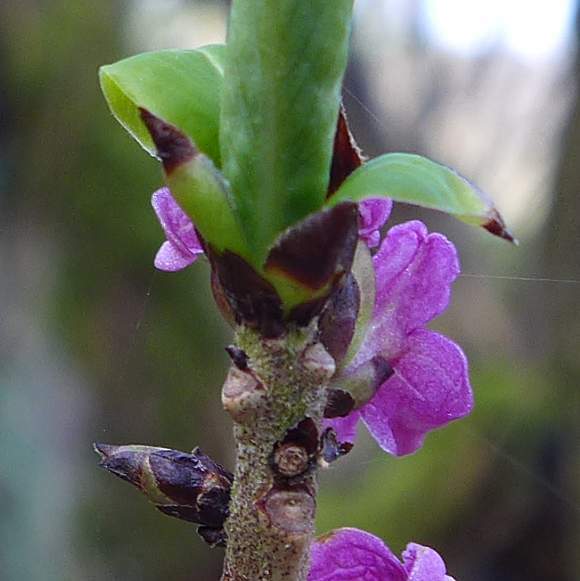 The Phorbol Esters are confined to the Spurge Family [Euphorbiaceae] and the Thymeliaceae Family, of which Mezereon is a member. [See Sea Spurge for many other Phorbol Esters]. Both phorbol esters contain an active 1,2-epoxy group, shown in red. 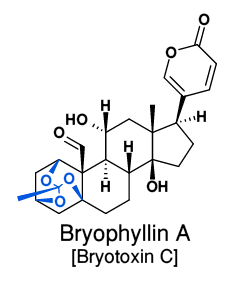 The pyramidal group with the three bridging oxygen atoms (epoxy-groups, shown in blue) is found in some other highly toxic substances; such as Bryophyllin A, which is present in some poisonous plants of the Kalanchoe (Bryophyllum) Genus, which is not native to the UK (belonging to the Crassulaceae). 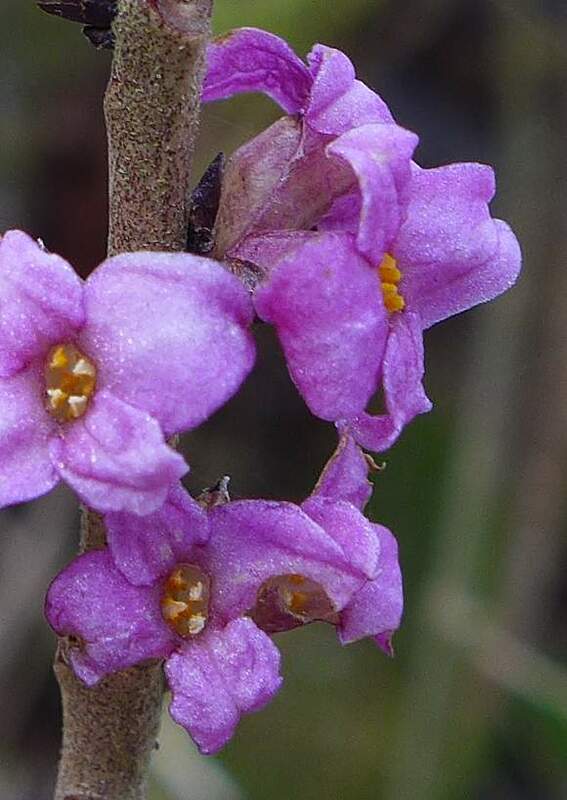 [Bryophyllin A is not a constituent of Mezereon]. 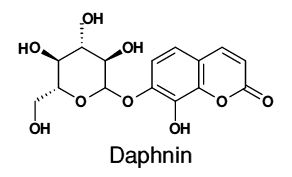 Daphnin(e) is a toxic glycosidic Coumarin produced within Mezereon and a few other plants belonging to the Daphne Genera. 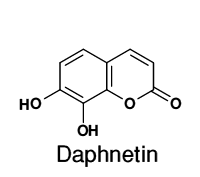 It is Daphnetin-7-glucoside. 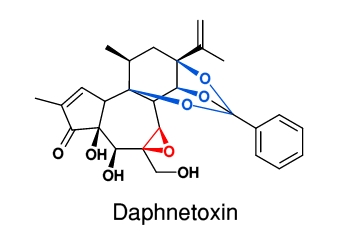 enzymes can release the sugar molecule liberating Daphnetin , a coumarin. 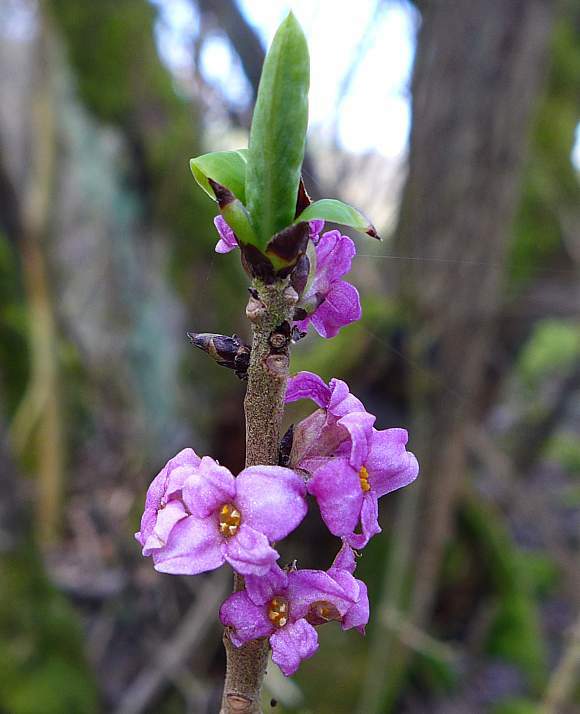 Mezereon also contains Umbelliferone another coumarin.